“The Double Life of a Cinéaste” follows contributor Tyler Tharpe as he balances the business of running a drive-in theater in the Midwest with the long and arduous process of filmmaking. When I go back through a screenplay draft, it’s the first thing I notice – how much I hate my own dialogue. If you watch one of my movies, you’ll be able to pick out a clunky piece of dialogue here and there. I’m seriously considering axing all dialogue at some point, or at least writing less dialogue than for my first two features. The only problem? Dialogue apparently plays a big part in selling your film. “Where’s the dialogue?” This is a complaint I heard frequently from my foreign sales representative who was trying to sell my last film, RETURN IN RED (2007), to some non-interested buyers from other countries at Cannes, the American Film Market, and so on. I’d say, “What are you talking about? There’s plenty of dialogue in there.” In the end, he did sell the film to a few countries/territories, but not as many as I would have liked. So, this “where’s the dialogue” issue has been bugging me for a long time and it’s something I don’t quite understand; animator Bill Plympton (HAIR HIGH, IDIOTS & ANGELS) says his work is more salable overseas because his films contain very little dialogue and tell stories mostly with visuals, requiring little to no audio dubbing. That’s what I thought my film does. If you don’t speak English, you should be able to easily follow what goes on in the movie, which I feel tells the story visually and contains dialogue only when necessary. The more I thought about it, I realized at the heart of the complaint is that my film doesn’t contain dialogue “spoon feeding” to the audience every single little detail. The in-joke about Hollywood product is that studio executives want dialogue to “explain what you just saw, and then explain the explanation” or something like that. This is fine, but I don’t even bother going to those kinds of movies. I can’t fully enjoy a movie that pours on dialogue overrun with details. Last year’s remake of TRUE GRIT, for instance, starts with literally 20 minutes straight of dialogue from the very opening shot, including what feels like a 10-minute courtroom scene. All this took me straight out of the movie, or rather, never let me into the movie in the first place. INCEPTION was the same way, unfolding so much dialogue that at the midway point, I was ready to hit the exit. On the other hand, a film like NO COUNTRY FOR OLD MEN (2007) is a perfect example of the “show me, don’t tell me” rule of filmmaking, a practice I feel all filmmakers should utilize. Anyone who has seen that movie and liked it would agree the ultra-engaging opening sequence, during which Josh Brolin’s character discovers the aftermath of a bad deal gone wrong, draws you completely in … and it is achieved with no dialogue whatsoever. Another movie I liked as a kid, THE ROAD WARRIOR (1982), is an example that encompasses “show me, don’t tell me” perfectly. I remember reading about the intentions of the Coen Brothers – responsible for both NO COUNTRY FOR OLD MEN and the new TRUE GRIT, curiously – to film the late James Dickey’s final novel To the White Sea, apparently with little to no dialogue. This sounded exciting and I immediately put it on my radar, although they were due to start production in 2002 with Brad Pitt in the lead role. It has since been cancelled. Of course, this isn’t the silent age and movies need dialogue. I have no problem sitting and listening to good dialogue – most of Quentin Tarantino’s films, for example, contain great dialogue – but my favorite movies tend to be ones where the dialogue springs naturally and sparsely from the characters and situations. The work of Jon Jost (SURE FIRE, THE BED YOU SLEEP IN) and Kelly Reichardt (OLD JOY, WENDY AND LUCY) are incredibly rich films, all achieved with minimal conversation. I understand Reichardt’s latest film, MEEK’S CUTOFF, begins with 10 minutes of movie before any dialogue is spoken. I love that concept and can’t wait to see MEEK’S CUTOFF based on that alone. One of my first real films, made my senior year in college, had zero dialogue. Even though that was born somewhat out of necessity – I shot with silent Super 8 film stock and had no idea how to record and synch dialogue at the time, even though I was able to Foley all the sound effects – the film remains one of the strongest visually that I’ve made. 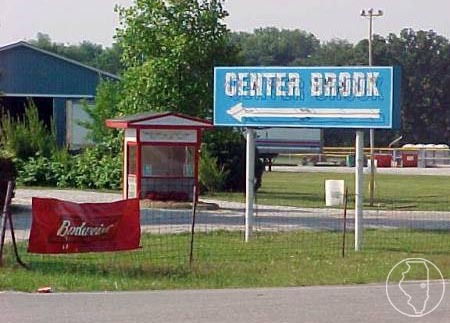 Back at the Centerbrook Drive-in, I’m in the beginning of my fourth season as owner-operator. I wouldn’t dream of showing a movie with little to no dialogue so what did I open the 2011 season with, ironically enough? TRUE GRIT! The films I play here obviously are dialogue driven where everything is explained, and the explanation is explained, et cetera. I guess I can understand this; customers who come here want something fun that doesn’t preach or is too arty. Big tent pole popcorn movies are our bread and butter. BLACK SWAN might have been my personal favorite release of 2010 but I’m not sure it would play well here; maybe as a second feature on a bill, but who knows. Something like my favorite film of 2007, THE DIVING BELL AND THE BUTTERFLY, I would be an idiot to try and play here. In the meantime, I’m gearing up for one of the biggest films I will probably play at Centerbrook this summer, TRANSFORMERS: DARK OF THE MOON. I dread the two or three weeks I’ll have to sit here and listen to another TRANSFORMERS movie, which will probably continue the trend of fostering the worst and most banal dialogue of any movie franchise in history. I hate to admit it but these movies fill the house (only God knows why) and are the perfect definition of popcorn movies, so you’ll hear no dialogue coming from me complaining about TRANSFORMERS when the non-Autobot cars line up from front to back to see it at our non-Decepticon drive-in this July. Tyler Tharpe is an Indianapolis resident who has a B.A. in Telecommunications with an emphasis on film from Ball State University. He is currently an independent filmmaker and drive-in theater owner/operator who can be reached at tylertharpe [at] yahoo [dot] com. “The Double Life of a Cinéaste” no. 2 © 2011 Tyler Tharpe. Schokkend Niews #77 cover © Schokkend Niews, Amsterdam. Used with permission by Bart Oosterhoorn. Click to follow the making of PHANTOM COMPANION on Facebook! Click to see what’s playing at the Centerbrook Drive-in! This entry was posted on Tuesday, May 24th, 2011 at 6:00 pm	and is filed under Column du C-U, Double Life of a Cinéaste. You can follow any responses to this entry through the RSS 2.0 feed. Both comments and pings are currently closed. 14 distant relations of Jan Tschichold dissected this page in 0.380 seconds while exacting sweet revenge in silence.